It still happens. I see countless opportunities to create on the iPad wasted. Instead, a worksheet (that has been used for several years) is scanned, turned into a PDF then uploaded to a platform that allows a student to annotate the PDF on the iPad. It's not good practice. Period. A worksheet on an iPad is still a worksheet. It's boring. We are paid professionals, we can provide better opportunities for our students. 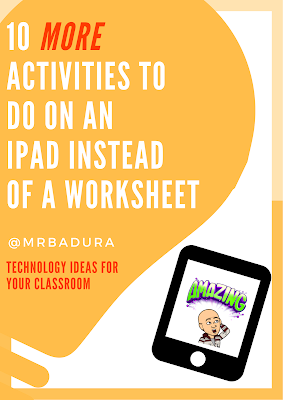 In a previous blog post I listed some activities that could be done on an iPad instead of a worksheet. That was two years ago. As professional educators, we should continually strive to hone our craft, so I've decided to offer some more activities that can be done on those iPads in your classroom instead of a worksheet. Thank you, Google! What a great selection of tools to choose from. If your school is fortunate enough to be a "Google" school you will know what I mean. Google Docs, Forms, Slides, Sites, Sheets, Drive offer your students a variety of tools to do some pretty amazing things in your classroom. Be sure to check out the #gsuiteedu, #gafe and #gafe4littles hashtags for all sorts of ideas on how to effectively use these tools in your classroom. I absolutely love the creation possibilities with Adobe's Spark Post, Spark Page and Spark Video. Adobe has made it so easy to create with these apps. With these apps, you and your students will be creating professional looking products in no time. Social media is not going away. We, as educators need to be using it in our classrooms. You need to find ways to make Twitter, Instagram, Snapchat and other forms of social media an integral part of your classroom. For some great ideas on how to utilize social media in your classroom, I would suggest that you follow Kayla Delzer, Brandon Timm, Rebecca Huls and Kara McNeese. Each of them do a tremendous job of harnessing the power of social media in their respective classrooms. Trust me, your students will love this app! You create "missions" that your student will complete. You can have your students complete missions that are photo/video, text-based or GPS check-ins. I used this app with our teachers at the start of the school year for a school wide scavenger hunt. Each building in our district (elementary, middle school, high school) competed against each other to complete the challenges that I had set forth. The winner from each building received free jeans days for the entire first quarter. Talk about competitive. Very engaging and fun too! Hyperdocs are awesome! What are they? They are digital lessons that you can assign to your students for engaging, inquiry-based learning. It's blended learning at its finest. Think 21st-century worksheet." Your students learn by exploring, explaining and applying as they progress through the hyperdoc. Be sure to give the creators of the Hyperdoc idea Lisa Highfill, Kelly Hilton and Sarah Landis a follow on Twitter. For resources be sure to check out this Padlet full of Hyperdoc examples and head over to Teachers Give Teachers to search for Hyperdocs! Make a copy of one that works for your classroom, modify if needed and assign to your students! I truly believe that Seesaw is the best educational technology app that has been released in the last two years. What a way for students to document their learning! Seesaw is a digital portfolio for your students. My favorite features are the fact that your students can submit work that they have created, use the whiteboard tool to draw and record their voice (on a whiteboard or something they uploaded), and use the video camera for self-reflections. Parents can see this all of this if they have downloaded the parent companion app to Seesaw. Create your account, set up a class and start using Seesaw. Your classroom parents will thank you! Very low tech, but so fun for your students! I always had a tub of "creation tools" (markers, colored pencils, glue sticks, scissors on the tables in my classroom. Nothing beats creating something from scratch to assist in the learning process! Students love to draw, doodle and color. Don't forget about these "old school" tools when you get the tech in your classroom. Harness the power of both tools with a paper slides project. Let your students create paper slides projects instead of standing in front of the classroom going through a Powerpoint or Google Slides presentation. Here is a great wiki with all sorts of information about paper slides. Compliment Digital Storytelling projects with animation apps. Those of us that have access to iPads know that the best app for digital storytelling would probably be iMovie. Honestly, I've seen this app wear out its welcome with a lot of our students (and teachers). Making iMovie after iMovie becomes tedious and boring. Tap into the creativity of animations apps. Combine these with iMovie and you can create some pretty amazing stories! Here is a recent blog post I composed about FOUR free animation apps that you can begin using today! I love Canva! If you haven't created an account for Canva, do so now! Canva has an app and is web based so you are not limited to the app. There are so many ways to use Canva in the classroom. You could have your students use it for vocabulary, motivational posters, movie posters for a particular book you are reading. You could have your students create album covers for a book you are reading, create six word stories with a powerful image in the background. The opportunities are endless. I'm not going to give you a specific tool for my tenth option. I just want you to think about one word. Create. Think of the iPad as a creation device. It's very easy to consume information on the iPad, but it's just as easy to create. What can you create on the iPad to reinforce or amplify your lesson?